House Husbands return helps Nine win Monday, Spelling Bee slips. 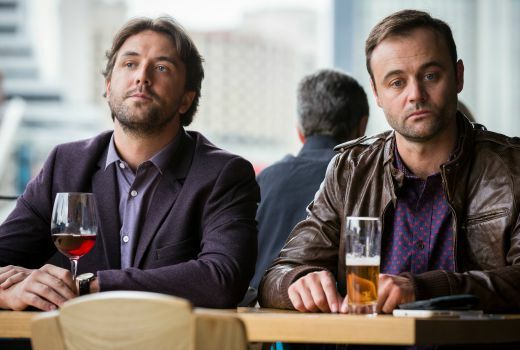 Nine enjoyed a winning streak through to 10pm last night with Hotplate‘s 962,000 as its best figures so far and the return of House Husbands at 855,000 -up 16,000 on its 2014 premiere. Seven improved on last Monday thanks to Highway Patrol‘s 789,000 replacing Restaurant Revolution, both of which saw The Great Australian Spelling Bee pushed into fourth place on 655,000. Elsewhere ABC ranked second with its early evening line-up, while Today had another win over Sunrise. Nine network won with 30.0% then Seven 25.8%, ABC 20.3%, TEN 17.9% and SBS 6.1%. Nine News (1.21m / 1.14m) topped the night. Next for Nine were A Current Affair (1.00m), The Hotplate (962,000), House Husbands (855,000) and Hot Seat (671,000). Footy Classified was 239,000 in 3 cities. Seven News (1.02m / 1.01m) was best for Seven then Highway Patrol (789,000), Home and Away (764,000), Motorway Patrol (683,000), Ramsay’s Hotel Hell (519,000), Million Dollar Minute (501,000) and The Blacklist (359,000 / 263,000). Talking Footy was 20,000 in 3 cities (96,000 on 7mate). ABC News (853,000) led for ABC then 7:30 (834,000), Australian Story (800,000), Four Corners (621,000), Media Watch (598,000) and Q & A (596,000). The Great Australian Spelling Bee was down by 29% to 655,000 on TEN followed by The Project (629,000 / 497,000), TEN Eyewitness News (627,000), Have You Been Paying Attention? (601,000). NCIS: N.O. was 188,000 and Under the Dome was just 71,000. The remarkably-titled Why Are Thin People Not Fat? drew 326,000 for SBS. The Island with Bear Bear Grylls was 255,000 / 232,000 and SBS World News was 144,000. 7TWO’s A Touch of Frost topped multichannels with 249,000. OzTAM Overnights: Monday 10 August 2015. Tags: 7:30, A Current Affair, A Touch of Frost, ABC News, ABC News Breakfast, Australian Story, Footy Classified, Four Corners, Have You Been Paying Attention?, Highway Patrol, Home and Away, Hot Seat, House Husbands, Media Watch, Million Dollar Minute, Motorway Patrol, NCIS: New Orleans, Nine News, Q&A, Ramsay's Hotel Hell, Restaurant Revolution, SBS World News, Seven News, Sunrise, Talking Footy, TEN Eyewitness News, The Blacklist, The Great Australian Spelling Bee, The Hotplate, The Island with Bear Bear Grylls, The Project, Today, Under the Dome, Why Are Thin People Not Fat? House Husbands definitely seemed to mark a return to more of a family focus last night. The hardest thing was trying to make sense of everything that had changed since the end of season 3. “Talking Footy was 20,000 in 3 cities (96,000 on 7mate).” – surely can’t be worth airing with figures that low? More people go to AFL games each week than that! It’s a 7mate property, the Seven replay is late. I log it in the interests of balance, rather than just Footy Classified. Am I the only one who thinks House Husbands is seriously lame? I thought I would give it another go last night seeing as though it was the season premiere but I found it so clichéd and predictable. It treats the audience like idiots and the acting is overdone by some of the characters. Woeful! House Husbands is seriously lame for sure. Watched last night in the hope it may have improved but it was cornier and hammier than ever and the overacting was woeful. Surely viewers deserve better than this from locally produced drama, (not to mention some of the well known actors involved). Yes, I don’t know the exact statistics, but I recall when Sally left it slipped below 1 million and this year it has definitely in my opinion not recovered from all the triple episodes late last year. It has definitely stayed under 800,000 this year consistently and not risen over 800 in recent months. Interesting segment on Media Watch last night about Seven’s Restaurant Revolution. Apparently 7 promoted it to death, to the extent that it was an item on 7 news nationally, was a feature on Sunrise, The Morning Show and The Daily Edition. This was to be the greatest cooking series ever. As we all now all know, RR is the biggest flop ever. HotPlate, however, is going from strength to strength. See that Spelling Bee numbers are down significantly, as was to be expected. Not really suited to the 7.30 timeslot. Would be better on at 6.00 or 6.30 Sunday night. Seven’s endless”on channel” promotion included the “dancing mum? ?” from Brisbane. Surely this was a great put off. Where as Parker-Bowles from “the hot plate” did the radio rounds (including ABC local Melbourne)before hand, giving the personal touch. There was only one show that was worth watching last night, Australian Story ‘From Daddy’s Tummy’. I found it challenging and eye opening. None of the other options fit that bill at all. Absolutely agree. I like my values being challenged. It was a confronting 1/2 hour of television. Blacklist Season 2 DVD has dropped in price to $34.99 at Amazon – due for release August 18. Given the numbers for Spelling Bee are still similar to those IACGMOOH was getting I think TEN would still be happy with the result. Being the 3rd (underdog) commercial network ultimately means they get less viewers for non-event series simply because people are stuck in their ways and watch Seven or Nine no matter what is on (like seriously I don’t think there are avid Boarder Control viewers). Sunrise is starting to look old and tired and resorting to cheap gimmicks in a desperate bid for ratings. The show is in need of a major refresh, perhaps a new set, new segments or even new presenters. I think the whole 7 network are in need of a major refresh; from Sunrise to 6pm news and all the graphics, promos, supers and maybe even an updated 7 logo. That was because we all thought it was going to be good.